In 1901 the North Eastern Railway's (NER) General Manager, George S.Gibb, visited the US on a fact-finding trip. This led to the decision to increase the size of the NER's freight trains. One of the results of this was the introduction of the impressive looking NER Class P2 (LNER J26). Although it caused quite a stir when it was introduced, in reality the J26 was essentially the same as a J25 (NER Class P1) but with a much larger boiler. The firebox was 1ft longer, and the boiler diameter was increased by a massive 15in. This new firebox could no longer fit between the trailing wheels, so a sloping fire grate was fitted, and the frames were extended by 11in. Thirty J26s were built at Darlington in 1904-5, and twenty were built at Gateshead in 1905. The first J26s were built with a high operating pressure of 200psi, but this was reduced to 180psi in May 1905. The last J26s were built at the new operating pressure. 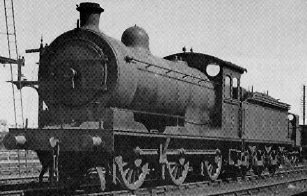 The J26 was further modified in 1906 to produce the J27 (NER Class P3). These modifications included a small reduction in the number of boiler tubes, and a reduction in the fire grate's slope. The original J26 fire grate had a 1ft slope to give a wide clearance above the rear axle, and hence avoid unnecessary bearing heating. It was soon decided that this slope could be safely reduced, so the J27s were built with a shallower fire grate that allowed for a 6in deeper firebox. The differences between the two boiler types were small, and it was decided to standardise both classes on the newer J27 boiler. The first J26s received the new boiler in 1910, and the last was converted in 1925. The J26s required minor stay modifications to allow the new boilers to be fitted. A further boiler re-design occurred in 1937, when the LNER modified Diagram 57 to produce Diagram 57A. The modified design included a sloping throat plate resulting in a firebox that was 6in longer overall. The boiler was 5in shorter to compensate. The boiler barrel changed from a three-plate construction to a one-plate construction. The tubes were increased to 273, with a net heating surface of 1655.6 sq.ft. The most visible change on the Diagram 57A boilers was that the dome was positioned 1ft 1in further back. The last J26 received a 57A boiler in June 1958. Withdrawals had started by this time, and some of the converted locomotives had already had their 57A boilers swapped back to 57 boilers. The Diagram 57 and 57A boilers were built in both saturated and superheated variants, but the J26s only ever received the saturated variant. As with other NER types, Ramsbottom safety valves were initially fitted. This was the four column type mounted in a squat brass trumpet of the type recently introduced on the Class V (LNER C6) Atlantics. This was later replaced by two Ross pop safety valves. These were initially in a brass casing, but this was later removed. All of the J26s were built with NER circular pattern cab spectacles. After the introduction of the Q6 0-8-0s in 1913 with their large shaped spectacles, West Auckland shed petitioned for the earlier Q5 0-8-0 to be similarly altered. This was quickly carried out, and both the J26s and J27s were similarly modified. Although all of the J27s would eventually receive the modified spectacles, modification of the J26s was abandoned by the NER before Grouping (1923). A total of 28 J26s retained their circular spectacles. When introduced, the J26s were mainly used on long distance goods and mineral services. After about ten years, they were displaced from these duties by newer Q6 0-8-0s, B15 4-6-0s, and B16 4-6-0s. At Grouping (1923), the largest J26 allocations were to York (11), West Hartlepool (9), Haverton Hill (7), and Newport (6). Brough Gardens, Blaydon, Tyne Dock, East Hartlepool, and Starbeck all had two J26s each; and Heaton, Percy Main, Neville Hill, Selby, Darlington, Ferryhill, and Middlesbrough all had one J26 each. Allocations remained virtually unchanged during the 1920s. During this period, No. 379 was loaned to the GE section, along with a number of J27s. During the 1930s, Selby's allocation increased to eight. These engines worked into the South Yorkshire coal field including destinations such as Grimethorpe, and the Brackenhill Light Railway. In a wartime attempt to concentrate locomotive classes, the J26s were re-allocated in 1943. The entire class was confined to the Tees area with allocations to Newport (39), Middlesbrough (7), and West Hartlepool (2). These allocations lasted for ten years with only minor movements to Stockton and West Auckland during the early/mid 1950s. In 1958, both the Middlesbrough and Newport sheds were closed and the remainder of the J26s were moved to the new Thornaby shed. Withdrawals started at this time and were rapid. Final work included the difficult branch to the Kilton and Lingdale ironstone mines, and the heavily graded route from West Auckland to Durham. One of the last sightings was No. 65735 working down the Wearhead branch in May 1962. Although withdrawals were rapid, on a number of occasions individual withdrawals were paused due to a lack of suitable replacements. However, the widespread introduction of Type 2 diesels marked the end of the J26s and the last J26 was withdrawn in June 1962. Heating Surface: Total: 1587 sq.ft. None of the J26s survived into preservation. Union Mills sell an N gauge ready-to-run model of the J26. Nu-Cast, and Dave Alexander both sell whitemetal 4mm scale (OO gauge) kits of the J26. DJH produce an O gauge (7mm scale) kit of the J26.